With 16 waterslides, a 1,000 gallon tipping bucket, and full size wave pool, Fallsview Indoor Waterpark connects families with thrills and excitement in a totally unique location overlooking Niagara Falls. 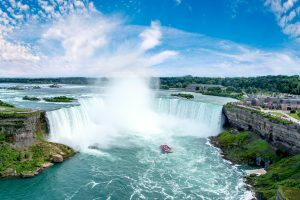 And if you’re on a family getaway to Niagara this summer and looking for even more fun and adventure, make sure to visit these other extraordinary Niagara Falls attractions. One of Niagara’s newest and most exciting attractions is the WildPlay MistRider Zipline to the Falls, located at the Grand View Marketplace on the Niagara Parkway. If you’re an adventure seeking family that wants to experience the beauty and power of the Falls while traveling 670 metres down a zipline, then this is the attraction for you. WildPlay MistRider Zipline to the Falls will take you on an amazing ride into the Niagara Gorge right towards the base of the Canadian Horseshoe Falls where you’ll stop at a beautiful Falls observation deck to take in the beauty of the Falls from below! 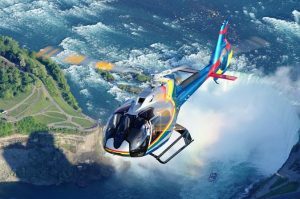 Take in spectacular views of Niagara Falls from an extraordinary vantage point on a Niagara Helicopters ride. This year-round aerial attraction lifts off from the Niagara Helicopters base on Victoria Avenue and begins by passing by the Sir Adam Beck Generating Plant and the Niagara Parks School of Horticulture. The journey continues along the Niagara River, over the Whirlpool Rapids and Rainbow Bridge, to the magnificent American and Canadian Horseshoe Falls. It’s a one-of-a-kind experience that offers amazing photo opportunities unlike anywhere else. For a high-speed boat ride through the class 5 white water rapids of the Niagara River, make sure to embark on a Whirlpool Jet Boat Tour. This one-hour exhilarating ride is full of thrills and excitement and will teach you all about the history and geology of the incredible Niagara River. You will be soaked by the water of the rapids as you venture close to the Niagara River Whirlpool and will experience a once in a lifetime ride that will definitely be a highlight of your visit to Niagara Falls. Hornblower Niagara Cruises (formerly known as the Maid of the Mist) is one of Niagara’s most iconic attractions and is a must-do attraction for people of all ages visiting Niagara Falls this summer. Get ready for a fun family getaway full of exciting Niagara Falls attractions and start planning your summer getaway today!